Huge Savings Item! 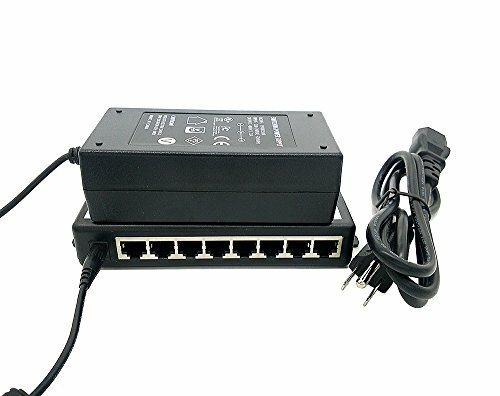 Save 17% on the iCreatin 48V 65W 8-port Passive power over ethernet PoE injector Adapter with Power supply for 8 IP Camera, VOIP phones or Access Points and more by iCreatin at Pacs BG. MPN: 4328625203. Hurry! Limited time offer. Offer valid only while supplies last. NOTE: This PoE kit only for 10/100Mbps Devices Which support PoE function.Please check your device is POE enabled before you buy this item,Thanks! NOTE: This PoE kit only for 10/100Mbps Devices Which support PoE function. Please check your device is POE enabled before you buy this item,Thanks! Add PoE ability to any Ethernet switch or router. Use this device to inject power into the CAT-5, CAT-6 or CAT-7 cable. Standard Ethernet uses 2 of the 4 pairs, passive POE uses unused pins 4/5 for plus power, and 7/8 for ground. 48V 60W high quality UL listed power supply included, can power for IEEE802.3af device.